ICTO has been implementing IT Service Management (ITSM) System since 2016. It is based on the worldwide IT Service Best Practices (ITIL) to manage IT services so as to enhance efficiency and to provide better IT services. One of its system module we implemented is Service Request Management. With this module, all staff are able to submit, track and manage their IT service requests. 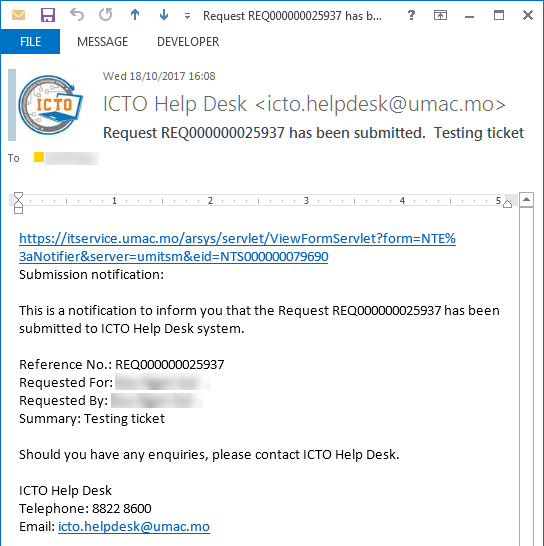 To access ICTO – ITSM System, please follow this link https://itservice.umac.mo and login with your UMPASS ID and password. 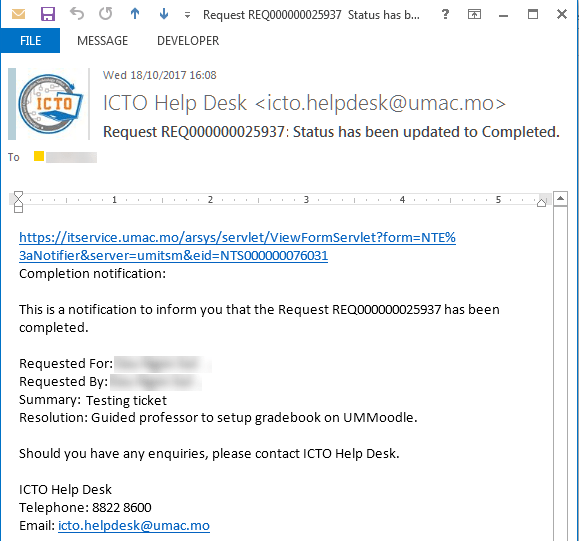 For other service request forms that cannot be found in the system, please email the request to icto.helpdesk@umac.mo. When you login to ICTO IT Service Management System, you will be taken to the Service Request Console page. Click “Browse” to view all the available service requests. Click a category to view available requests in the panel below. Select the request you want to submit from the Available Requests list to view details. Click “Request Now”. Provide the details of your service request and fill in the necessary information, then click “Submit” to send the request. Submitted requests will be sent to ICTO Help Desk to dispatch. You will receive an email confirming that the request is received by ICTO. A request number (REQ0000000XXXXX) is sent with the mail, the requester can use it for following-up the case. Once the request is completed, a follow up email indicating that the request is completed will be sent to the requester. 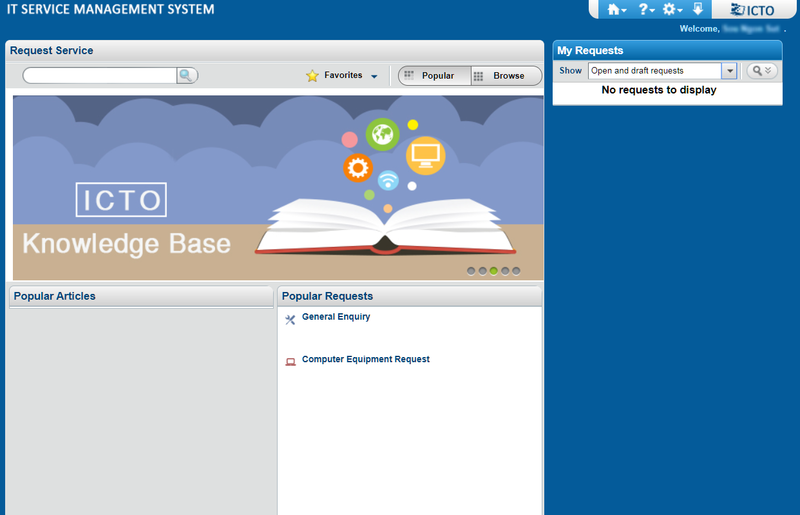 All of your requests are shown on the right pane “My Requests”. 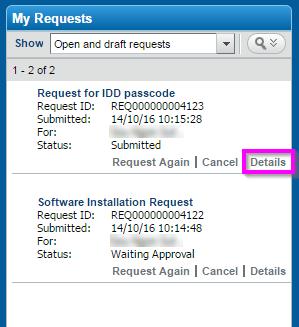 Each request is displayed with Subject, Request ID, Submitted Date and Status. Click the record name or click “Details” to view the detail information of the request. In the Request Details, the bar on the top displays the progress of the request current status. Draft – The request has been created but has not been submitted yet. Waiting Approval – The request has been submitted and is pending for approval. A request goes into Initiated status after the request has been approved. Initiated – The request has been received and queued in the system. In Progress – The request is in process of handling. Completed – The request has been processed. Closed – The request is closed and archived in system log. Approver will receive email notification when there are requests that require their approval before it is submitted to ICTO. 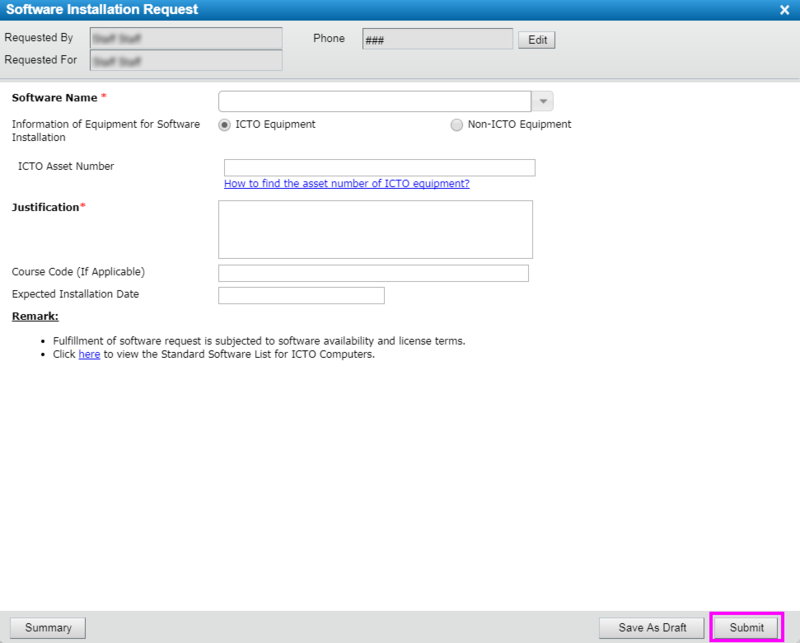 To make approval for the request, please login to ITSM System. You will see the number of Approvals requests on the top right hand corner if you are one of the approver in your department. Click to go to “Approval Central”. 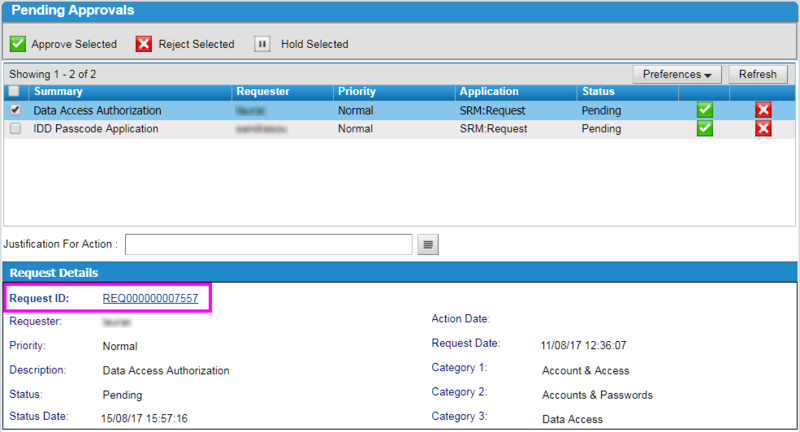 Select the request in the “Pending Approvals” table, a short summary of the request will be displayed under Request Details. To view detail information of the request, click the “Request ID number”. The Request Details will be prompted and you will find the details information in the “Additional Details” tab. Click “Close” to return to the Approval Central. Check the checkbox to select the request you would like to make approval. Click “Approve Selected” / “Reject Selected” or clicking the “Tick ” / “Cross ” at the right hand side. Click “My Approval History”, the table lists all the requests approved or rejected by you. If you have difficulty logging in or placing a service request, please contact our Help Desk.